At this time I have knocked on nearly every door and it has been a pleasure to chat with each and every one of you that I met. Most people are generally really happy with the service that they have received and the way in which their streets and neighbourhoods have been maintained and enhanced. Each footpath that is yet to be paved has been rated and ranked by Council Works management on its present condition. The worse they are, the sooner they will be replaced. Council has been experimenting with different footpath treatments, especially where there are trees. 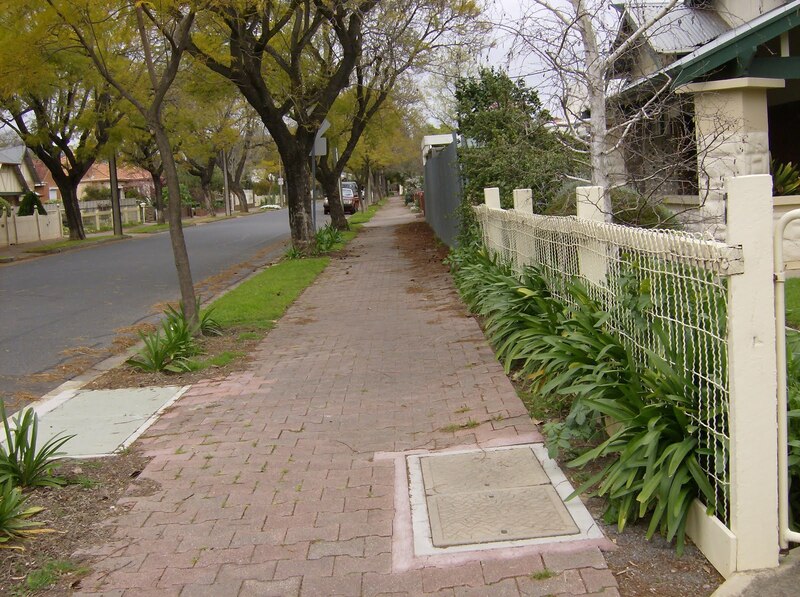 As you will be aware, trees near paved footpaths tend to lift individual pavers, causing trip hazards. You can see these alternative treatments on Cambridge Tce in Unley. Each year, when Unley sets its Budget, Council makes a collective decision on the amount to be spent on foot paths, including footpath replacements. The amount that is allocated to each Ward is dependent upon the percentage of footpaths already-re-paved by Ward and the condition of the footpaths listed next to be paved. Citywide, the allocation for footpath replacement in 2010/11 has dropped from $572000 in 2009/10 to $526000 in 2010/11 for a very good reason – meeting Council’s legal requirement to install pedestrian ramps to serve people with disabilities had to come first. Goodwood South Ward is allocated 19% of the footpath replacement budget, slightly more than 16.7% if each of the 6 Wards gained an equal share. Aroha Terrace is separately funded in excess of $1M for the footpath and road re-construction. This year we will see 5 streets – Aroha, David, Henry, Ormonde and Spiers Streets re-paved. In 2011/12, Chelmsford, Lincoln, Oakley and School Avenues are to be re-paved. In 2012/13, Churchill Avenue and Meredyth Avenue are to be re-paved. In 2013/14, Fairfax and Birkdale Avenues are to be re-paved. I will seek a report on the prospect of re-paving all the remaining 30% of Unley’s footpaths over the next 4 years, asking the staff to project escalating construction costs against estimated interest costs to borrow funds to accelerate this improvement to infrastructure to assess what is a prudent financial decision. Let me assure you, if re-elected I will continue to strongly advocate for GSW to ensure we continue to get our fair share of moneys budgeted in each years budget and that works are completed to schedule.